With the right advisor, having children during a PhD can be a great joy, but lack of affordable childcare is a problem. Bede Portz has been a postdoc at the University of Pennsylvania since 2017, and researches liquid-liquid phase separation in the context of neurodegenerative disease. He had twins in 2013, during the third year of his PhD at Penn State University. Bede Portz with his two children. Image credit: Anna Portz. How has your life led you to becoming a scientist and a parent? After I finished my undergraduate degree in microbiology, I worked as a technician in David Gilmour’s lab in ­the Center for Eukaryotic Gene Regulation at Penn State for a few years, and during that time I got married. When I decided to go to grad school, we were unsure if children were in our future. Nevertheless I sought out a mentor that successfully balanced family and academic life. I started my PhD at Penn State, under the supervision of Dr David Gilmour, who managed a successful academic career while clearly valuing his family life. We decided to have children during the middle of my PhD, and ended up having twins! I am currently a postdoc at Penn in the lab of Dr James Shorter, which has proven to be a very supportive environment for trainees with families as well. We moved with pre-school age children. What support have you received as a parent? My adviser was a huge influence. I was allowed six weeks of parental leave, which I took. During this time, he didn’t contact me at all, other than sending me one email to offer to bring us dinner and meet the twins. He truly let me devote my parental leave time to my family. When I returned back to work, he allowed me to stay home on Fridays for the first year: instead, I could work on weekends when my wife was at home so we could reduce our childcare costs. My wife is a cardiac nurse, a great career but one that provides less flexibility than academia, so I was most often the parent to stay home when our kids were sick or school was closed. Again, my adviser was incredibly supportive and flexible. We also had family a few hours away, who helped when the kids were babies. Accessible childcare! Many university childcare centers have long waiting lists, over a year in some instances. Even if there is availability, they are often priced such that PhD students and postdocs could never afford them. 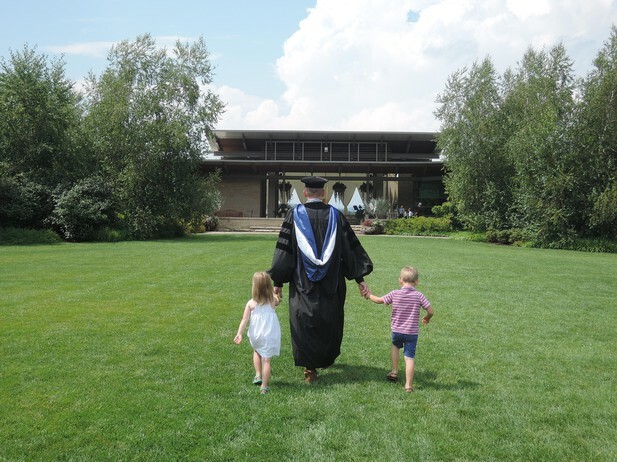 During my PhD, on-campus childcare for the twins exceeded my stipend: it simply wasn’t an option. We had to juggle a complicated childcare schedule instead. Affordable on-campus childcare options would go a long way in enabling scientists with children, and hopefully more women, to stay in academia instead of having to leave for more lucrative positions. It would also be a major recruiting tool for universities, especially at the postdoc level. What advice would you give to scientists who are thinking of having children? Do it. The magnitude of the joy it has brought me far outweighs any career challenges. I look back on career-related reasons we waited to have kids and they all seem so trivial in hindsight now that I have experienced the joy of having kids. The idea I put such a rewarding and joyful element of my life on hold for professional reasons is regretful. Balancing time with my wife and children while also meeting expectations in the lab can be difficult, and having children – especially twins! – likely added time to my graduate school career, but it was beyond worth it. Doing a PhD when having a baby will be complicated, but it can be done! I had plenty of post-graduate options inside and outside of academia and found an ideal postdoc, with a very supportive mentor, in a lab where other postdocs with children are thriving. Compared to other professions, what advantages and disadvantages are there to being a parent scientist? With the right advisor, I think science can offer the advantage of flexibility – you don’t need to punch a clock. However, expectations are high and long hours are required. The comparatively low wages relative to childcare and housing costs can make academic careers difficult for parents, especially in certain cities. Universities need to do more to ensure all trainees with children are treated fairly, not just those of us fortunate enough to have caring mentors.